Teach music and songwriting in ways that keep students engaged, excited, and inspired. Hooktheory Classroom combines engaging music theory material your students love with an innovative musical sketchpad, tailor-made for education. Students can explore and apply what they learn, as they learn. Hooktheory Classroom’s assessment, grading and management tools keep you efficient and organized, and let you teach and assess in creative new ways. Below, you can learn more about each component of Hooktheory Classroom. A musical sketchpad tailor-made for education. Nothing ignites students' musical creativity and artistry more than exploring and creating music on their own. We've built the perfect tool for this: Hookpad. 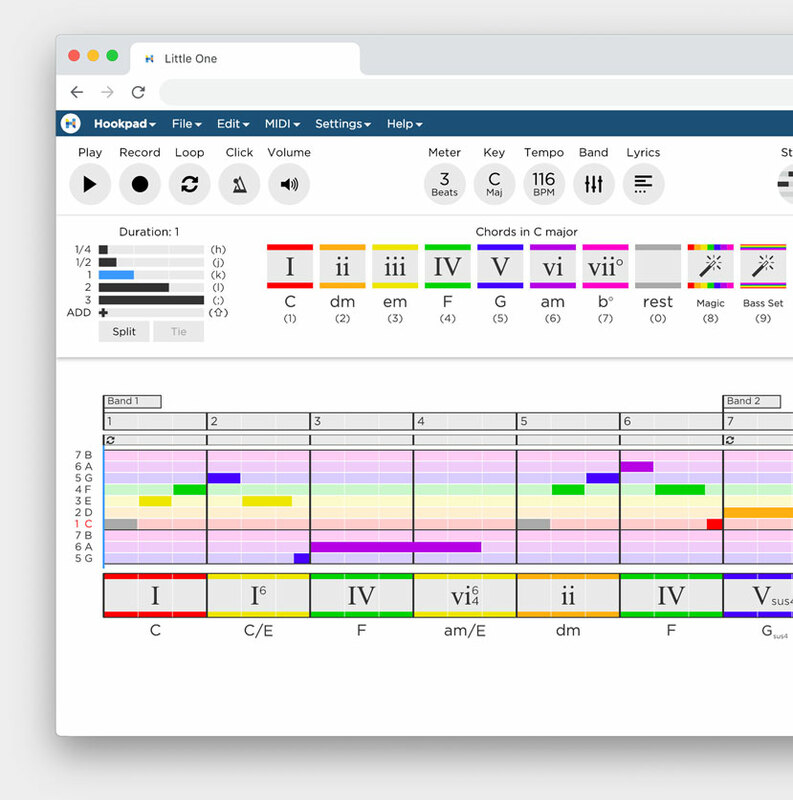 Hookpad is an online sketch pad for musical composition that emphasizes music theory concepts and visualizes music in a way that facilitates instruction and learning. Hookpad is fun, easy to use, and students love it. Composition and music exploration in Hookpad is based around building chords and melodies from the notes of a scale. Since Hookpad lives in the web browser, it can be used at school or at home. A music theory book your students will love. 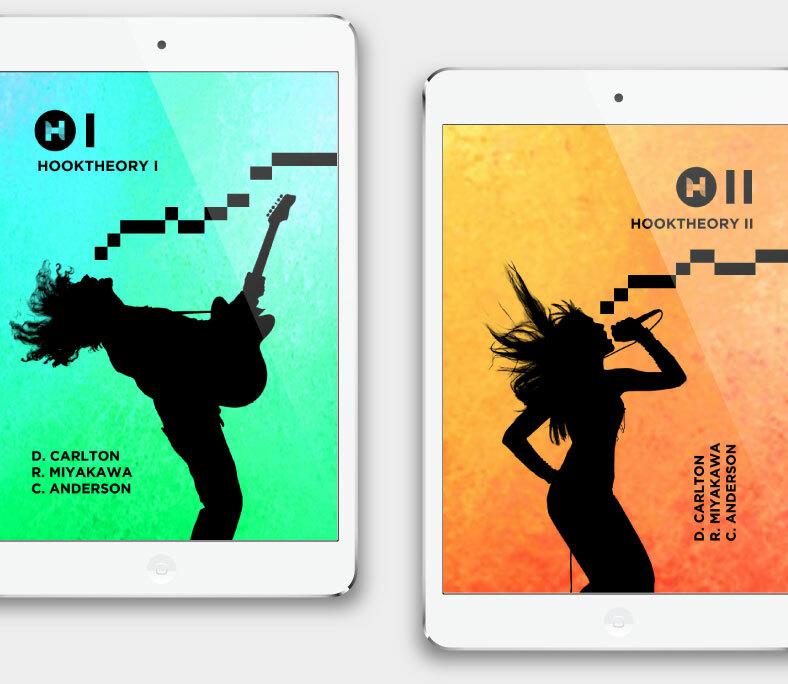 Our acclaimed music theory/songwriting book, Hooktheory I, is an intuitive, modern take on music theory. It was written from the ground up to be used alongside Hookpad so students can immediately apply the concepts they learn and create music as they read. Hooktheory I is 6 chapters long with 41 exercises and 94 audio-visaul examples from artists like: Avicii, Beyoncé, Bruno Mars, John Mayer, Lady Gaga, Maroon 5, Pink, Rihanna, and Taylor Swift. Use Hooktheory I to guide or supplement your curriculum and as the perfect companion for Hookpad. Engaging music theory and songwriting assignments. Assessment Kit is an organized way to create, assign, and grade music theory and songwriting assignments based around Hookpad. Your students compose in Hookpad (or load in an existing Hookpad project) based on your prompt and you can view and grade their work. Students immediately see their grades and feedback; intuitive grading and management tools keep you efficient and organized. You create a "Hooktheory class" for every class/period you teach. Each course is assigned a unique signup code. Students use the code to create a Hooktheory account linked to your class. Once in your class, students gain access to: Hooktheory’s online music theory / songwriting book, Hooktheory I, Hooktheory’s premium online musical sketchpad, Hookpad+, and you can assign them music theory and songwriting assignments with Assessment Kit. Hooktheory Classroom is COPPA compliant and suitable for students under the age of 13. Students pay by credit card when they join your class. Thank you @hooktheory 4 allowing 8thgr @ElmPlaceSchool to compose own chord progressions. You make satisfying, complex music so accessible! By far the most effective instructional aid for teachers looking to have students compose in the classroom. Yes. If you find that Hooktheory Classroom don't meet your needs, we will gladly refund your purchase. Just reply to your email receipt and we will issue you a full refund. We would love to hear from you. To get help, ask a question, etc. please send us an email at support@hooktheory.com. We make our best effort to respond to all inquiries within 24 hours.